Mann, 1919 PDF: 331 (q.). Combination in Carebara: Fernández, 2004A PDF: 235. See also: Taylor, 1991b PDF: 606. Plate_62_Carebara_atoma. Ecological and geographical distribution in Fiji (Sarnat & Economo, in press). Pacific Islands from New Guinea to Fiji. Fiji: Beqa: Malovo 182. Kadavu: Moanakaka 60. Macuata: Vunitogoloa 10. Moala: Naroi 75. Vanua Levu: Vusasivo Village 400 b, Rokosalase 97, Lagi 300. Viti Levu: Mt. Evans 800, Mt. Evans 800, Navai 700, McDonalds Resort 10 b, Mt. Batilamu 840 c, Ellington Wharf 1, Volivoli 55. The workers of this minute species are among the smallest ants in the world, and can even be difficult to spot in a litter sample under the microscope. It was suggested first by Wilson and Taylor (1967) that the Fijian and Samoan populations, with their sparser mesosomal sculpture, might represent a distinct species from the New Guinea type series. However, given the lack of sympatry of the two morphotypes, they decided against describing a new species. Subsequently, Taylor (1991) discovered specimens of both morphotypes from the same locality in New Guinea and offered a convincing argument based on sympatry that the name C. atoma Emery was being applied to two distinct species. Taylors investigation of the putative type material, however, could not definitively assign the name to a single morphotype. Of the three pins examined, only one with a single soldier bears a type label. Of the two other pins, one has workers of the more sculptured species mounted, and the other has workers of the smoother species mounted, but neither bear any label indicating type status. Reconciliation of the discussed specimens must await a more focused investigation of the Pacific Carebara and the designated type material than the present study can afford. Until then, we keep with the convention of applying the name C. atoma Emery to the species present on Fiji. Interestingly, Carebara atoma is one of the few species with a wide distribution across the archipelago which hasnt been recorded from Viti Levu. All of the specimens examined were taken from sifted litter. In Fiji: Diagnosis of minor worker caste in Fiji. Head shape ovoid to rectangular. Antenna 9-segmented. Antennal club 2-segmented. Mandibles triangular. Propodeum armed with denticles. Waist 2-segmented. 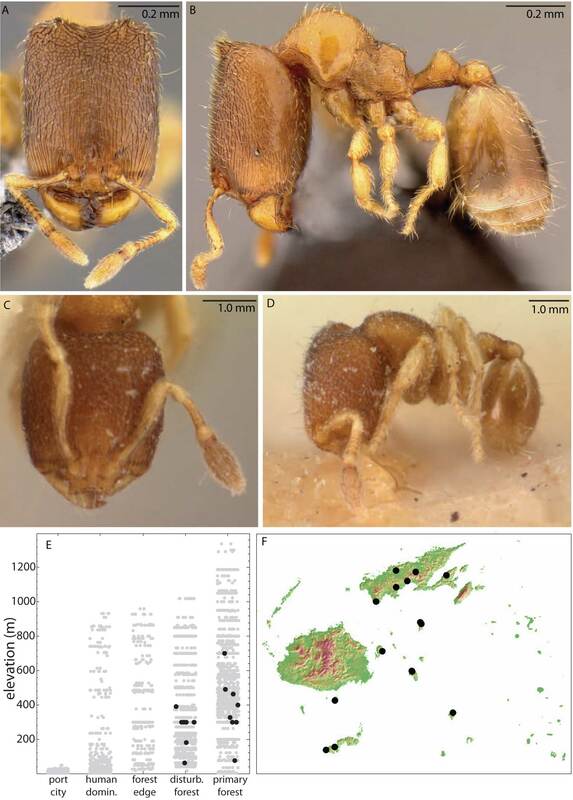 Represented in Fiji by a single species, Carebara is most often mistaken for a very small Solenopsis species such as S. papuana, on account of its color, stature and two-segmented antennal club. Carebara can be distinguished by its nine-segmented antennae (the club of which outsizes the rest of the funiculus combined) and its conspicuously armed propodeum. Moreover, the single species that occurs in Fiji is dimorphic, and the major exhibits an oversized quadrate head with horns projecting from its posterolateral corners. Found most commonly in these habitats: 7 times found in Primary rainforest, 3 times found in secondary forest, 4 times found in Rainforest, 3 times found in disturbed forest, 2 times found in 1° rainforest, 2 times found in coastal forest, 1 times found in riparian forest. Found most commonly in these microhabitats: 16 times sifted litter, 2 times ex. soil, leaf itter, decaying wood, 1 times ex sifted leaf litter, 1 times sifted litter (leaf mold, rotten wood), 1 times leaf mould. Collected most commonly using these methods: 16 times L, 1 times Winkler, 1 times Berlesate.